Editorials from Theslowlane: Picture before and after, Fairhaven Village Green. Also the Bellingham that was. Picture before and after, Fairhaven Village Green. Also the Bellingham that was. Not necessarily better than the Bellingham that is. Village Green in Fairhaven District, before it was spruced up recently. Some miss the funkier old ways. 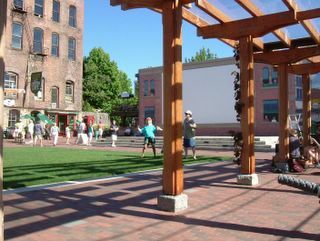 New Village Green in Fairhaven. 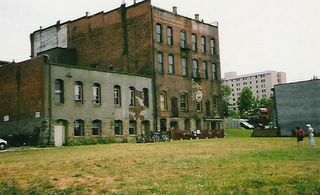 A friend of mine read, in tourist guide books, that Fairhaven was kind of a hippy hang out. When he got here, he said, "where are the hippies?" They're in some guide books, but not really here. In the Bellingham that was, my second day of college unfolded at Western Washington State College; WWU's name back in mid 1970s. A sulfurous fog blew across campus causing mild eye irritation. One campus newsletter was named, "Tuna Gas News" from the smell that often permeated the air from Georgia Pacific's pulp mill. Pollution control technology all but eliminated that smell during the 1980s. More recently, that pulp mill has closed, but it's air could be seen as a "preservative." It may have kept so many people from wanting to move here for retirement. Not only are there more retirees now, but students are swelling the ranks as well. Back in the mid 70s, Western's enrollment was declining. Quite the opposite problem from today when enrollment ceilings must be imposed on the popular school. Western grew in late 1960s with students seeking a deferment from being drafted. By mid 70s the draft was gone. Enrollment was going down. Also the post war baby boom was graduating and a smaller generation of college students was arriving. Faculty feared being laid off. It was like a downward spiral. Less students met less faculty. Less faculty met less class offerings. Less class offerings would attract even less students. It was feared to be a spiral of decline. There was a process called "Reduction In Force." Trying to trim the staff to meet lower enrollment levels. Someone nicknamed the whole thing, "Rip Off In Force," rather than "Reduction In Force." It was easy for students to get in to Western, however. The welcome mat was out. One didn't have to have a high grade point. They were almost begging for students. Soon after graduation, I rented a one bedroom apartment for $155 per month. It was a nice apartment. Could pay my rent from the few gardening and lawn mowing jobs I scrounged up. That was about the only work one could find. Bellingham is now benefiting, or suffering, from a double boom in world population trends. Just as post war baby boomers look for places to retire, their kids are going to college. The welcome mat is being replaced with a "full" sign. Things have been spruced up in town. Some fear it's been sanitized. Downtown Bellingham was scruffier in the early 1980s. It was "pragmatic." More traffic, before the mall was built. Less desirable, but it got the job done. Just past the bridge on prospect street, I remember noticing a view out over the bay. One had to squint between the bushes and a building to see it. Through tiny gaps among blackberry bushes, one could see a ship in port. Down below was an old sewage plant that is now Maritime Heritage Center. A woman must have wondered what I was looking at as she sat in the building dispatching taxies. I was trying to find the best gap between the bushes for seeing out over that bluff. She had a puzzled look on her face as if to say, "what's he looking at." Now, the area is a park and viewpoint. The old garage, that served as a taxi dispatch and blocked the view, is gone.